The life of a salesman can be hard and arduous, but it doesn’t have to be. You can use the Sales Call Register template to plan effective battle strategies to land your client and go into a sales call or meeting with complete confidence. The template gives you a space to list all the important contact information and plan ahead to engage your prospective client in a meaningful way. If you’re tired of losing sales due to poor organization, give this free template a try instead. The free template will take you through the steps you need to plan your sales strategy with a specific client. You will first list the client with their contact information. This way, you can reach your client from their email, phone, work phone, or mailing address. After that, it’s all just a matter of checking off the items on the checklist provided for you in the template to create your new strategy. As stated above, start on the tab marked “Client Contact Register” and go through the items listed in the header for each of your clients. This is simply your way of tracking all their contact information as quickly and easily as possible. The next step is to go to the “Checklist” tab before scheduling a sales call or meeting. This section was designed to help you come up with the perfect strategy to land the sale. You can also customize this section to fit the needs of a specific client. To change any of the pre-written information, just click the cell and enter something new. Next, once you have completed your checklist, you’re ready to engage with your client. The “Sales Call Register” tab is where you will enter the date and times for all your scheduled sales calls or meetings. This section also allows you to enter the highlight information of your client, such as the business they represent. 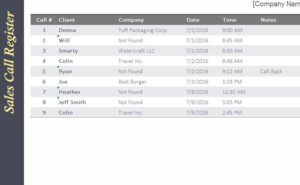 You can track all your sales and clients with this simple Call Register template!